This was created for personal use. I love the girl/foliage stamp from Waffle Flower, but I struggle with how to color it. This time, I used by MISTI tool, and colored each individual element and stamped separately. Multiple times (the main image was probably stamped 40 times! ), because my old Stampin’ Up! markers were not giving me great coverage on the clear stamp. I am mostly pleased with the finished product. I stamped butterflies on the background, and then added an embossed butterfly and an embossed sentiment. Supplies: Stamps – Clearly Besotted, Waffle Flower, paper – Neenah Classic Crest Solar White, Stampin’ Up! Bashful Blue (retired), Basic Black, Orchid Opulence (retired), inks – Stampin’ Up! Bashful Blue (retired), Certainly Celery (retired), Creamy Caramel (retired), Lovely Lilac (retired), Old Olive, Orchid Opulence (retired), Pretty in Pink (retired), VersaFine Onyx Black, die – Lawn Fawn (stitched rectangle), sequins – Darice, embossing powder – Ranger Silver Pearl. 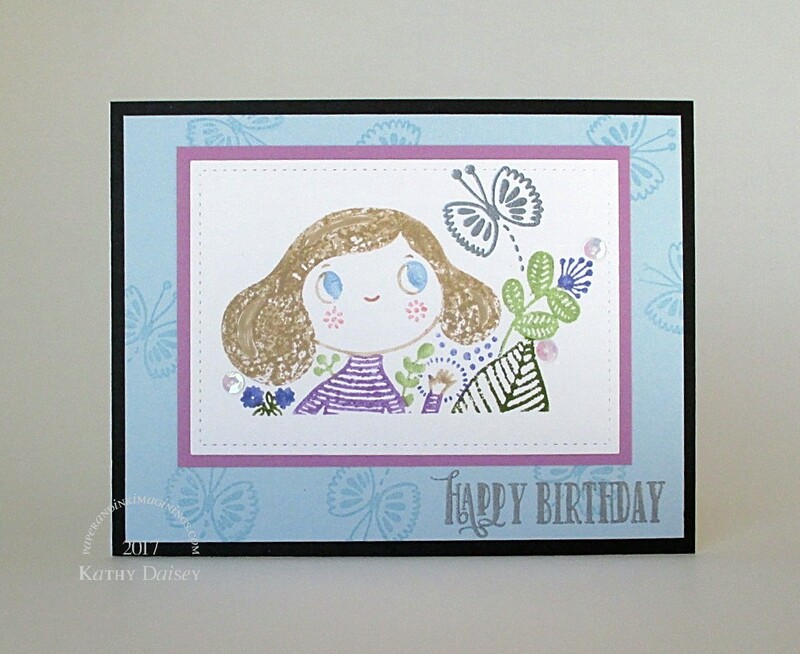 Categories: birthday, card | Tags: card, Clearly Besotted, Darice, Lawn Fawn, Neenah, Ranger, Stampin' Up!, Tsukineko, VersaFine, Waffle Flower | Permalink. This is really special. All you efforts were worth it.